Reconstruction (2003) pulsates with the times. The first feature film by Christoffer Boe and co. mixes experimentalism and “art cinema” with a certain grammar that belongs to publicity. New-born in its aesthetics – certainly different from any recent Danish films – Reconstruction is a kind of mental map of the places we inhabit in a contemporary world that apparently offers plenty of alternatives, but that finally leads us back to ancient aspects of existence: love and the difficulty of its consummation. Like in a game played with a mirror, a man who is in trouble faces repeatedly the horror of being unrecognised by the person he loves. This loss of identity is a “gag” upon which the film is built and re-built in a kind of uncertain movement towards nowhere. As if to go further would be to lose all weight in the chaos, this game drives us to different places and spaces where the boundaries between dreams and reality are weakly delineated. Reconstruction is a baroque film. Its theme and its aesthetics make it a good example of that movement where shapes tend to go to the limits, where style is composed by rhythm and repetition – little variations of the same things – where a totalised centre has vanished, being replaced by many centres. Equally, because of its interest in cinema as a material, its interest in going to the limit of the form – expressed through textures, lens and the use of digital effects – this is a good example of a post-modern work. And in this specific case, a commitment to exploring the nature of cinematic materials as well as telling a story creates an opaque atmosphere with some interesting bifurcations. Set in the charming city of Copenhagen, shot from a “non-objective” point of view – that of a photographer who seems to be “in love with love”, like many characters of the nouvelle vague – Reconstruction recognises that a point of view is, in some cases, constructed from images that belong to different times and aspects of culture. I am tempted to say that this culture-vulture view doesn’t make any distinction between publicity, art films, mainstream films, classical movies; it’s a point from which fragmentation emerges. That fragmentation brings a strange kind of nostalgia to the surface of the image. This is related to the fact that the period of classical cinema has ended. That state of emptiness – no more private islands of “happy ends” – has built a new form as dense as a classical film but more cryptic. Nevertheless, the pursuit of happiness is a motive that never finishes, never concludes, that is re-invented at every step, as we can see from the behaviour of the protagonist. Hence, the repeated mention of Rome is significant in the film: a city that never appears in it but that is determining the frame from off-screen, not as a “real space” but as a symbolic one: a Western European city where many classical movies used to go for love. And this is one of the cross-cultural references that the feature makes use of. At first sight we might say that Reconstruction is at the opposite pole from any Dogma film and yes, it is. Sound design, no shaking cameras, no familiar and domestic tragedies, no realistic point of view, no desperate cries and screams, no borderline personalities, no liaisons with political issues. Instead of that Decalogue, we find an anti-hero looking for love with a Hitchcockian blonde in a surreal atmosphere. However, it borrows from Dogma a remarkable thing: the author not as figurehead but as a part of a mechanism that works on many levels at the same time; from there emerges the idea of group, and also the idea of reworking and recycling. Made by young graduates from the National Film School of Denmark driven by Christoffer Boe, Reconstruction shows how cinema – and images in general – can create a mood through which to think the culture and act accordingly. 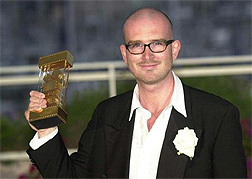 Reconstruction was awarded the Caméra d’Or for Best Director and Le Label regard Jeune for Best Film in Cannes 2003, and the Golden Plaque for Manuel Alberto Claro in Chicago International Film Festival 2003, among others. The following interview with Manuel Alberto Claro (cinematographer) and Tine Grew Pfeiffer (producer) took place during Mar del Plata International Film Festival at Hermitage Hotel in March 2004; further discussion was conducted by e-mail within the end of March and the beginning of April, and the end of May and the beginning of June, 2004. Lorena Cancela: What were the beginnings of the film like? Manuel Alberto Claro: The main group of the film, the producer, the director, the cinematographer, the sound engineer and the editor, we all went to the film school together, we graduated together, and we have done projects since 1997. We started doing short films and developing some kind of film-language together. Tine Grew Pfeiffer: The National Film School of Denmark in Copenhagen. LC: Are there many film schools in Denmark? MAC: Only one. There are some film colleges, programs, and there is an alternative school organised by students who wanted to go to the National Film School but weren’t accepted. The school (called “Super 16”) is very successful but it is not really an alternative. MAC: Yes, quite fast we found each other after starting school, sharing taste and interests, and then we founded this group and worked together, we did many short films together. We know each other so well, the atmosphere around the shooting of Reconstruction was familiar and relaxed. When we finished school, the director was contacted by a big production company in Denmark (Nordisk Film). They asked him to do a feature film. That was right after we finished film school. And he said “I will, but I will bring my team”. They accepted and I would say that Reconstruction is a further development of the short films that we did in school, it is some kind of “climax’”. LC: Could you tell me more about that development? MAC: Somehow we have gone from more experimental to more mainstream. Our first films were very experimental in form, extreme visual styles, very little story and hopefully a lot of pure emotion. Reconstruction is for me much more straightforward both story-wise and visually. Also the length of the film dictates the form, it is a fine balance between form and content. There is a time limit on how long you can accept formal experiments. LC: What do you think is the relation between the camera and the “reality” in this film, then? MAC: I try to photograph the film from a very subjective point of view. I try to put the camera in the protagonist’s situation. That way I hope our experience will be on a emotional level, relating to his experiences. In many ways I believe this depiction of a love story is very realistic from a psychological point of view. I find the fiction vs reality level very realistic. LC: Are you interested in any special movement, film-maker or photographer? MAC: Christoffer Boe is the driving force [of the group], and he is very influenced by Godard and Tarkovsky. In contemporary cinema he is influenced by Léos Carax, Lars von Trier but also Steven Soderbergh. In terms of photographers, we were very inspired by a French photographer, Jacques-Henri Lartigue. I don’t know how this inspiration appears in the movie, maybe we have a nostalgic view of beauty, generally we are inspired by old photographs. LC: Do you like Anthony Dod Mantle (Dogville‘s cinematographer)? MAC: Yes, I like him very much. He is a very nice person, but he is also a very interesting cinematographer. He is always an inspiration because he is a kind of anarchist, a crazy person. The way he approaches cinematography is very inspiring. I think he was the first in Denmark who broke with the classical rules, he is a front-runner for this kind of cinematography. I am definitely one of his followers, I like him. LC: Is there another cinematographer that you are specially interested in? MAC: Yes, I like Christopher Doyle, he is also a very big inspiration. There are also the Hollywood cinematographers such as an Italian called Dante Spinotti: he did a lot of Michael Mann’s movies, he is great. I like Slawomir Idziak, the Polish cinematographer that worked with Kieslowski, he is also very interesting. LC: How do you work with Christoffer Boe in the process of making cinematography for Reconstruction? MAC: What is interesting, thinking back, is that we talked very little. We didn’t prepare very precisely what to do, we know each other so well, we have the same references, so in that sense it was very easy. Every day when we started shooting we didn’t have a plan for what we were going to shoot. We had discussed the scenes and we knew what was necessary to tell the story, but we didn’t know what images we were going to do. It was very relaxed. I would say it was very easy – even though Christoffer might don’t agree with me when I say “easy”. He is always challenging the language and asking: “Is it right what we are doing?” I think we have a very natural way of working. LC: I feel attracted by the texture of the film. What can you tell me about it? MAC: I would say it is a mixture between what we like and what we could afford. Because of the budget we could shoot on 16mm, and we had a lot of ideas for the post-production, a lot of effects, so we wanted to go digital, through the computer. Our philosophy is: “You have what you have”. If you don’t have 35mm, don’t try to make it look as if it is 35mm. Don’t pretend, use the format, go with the format. Because of the low light we were working with, we had to use a high speed film, this film is very grainy, so we thought: “Let’s go with that”. We didn’t want to do something that looks “almost like”, we wanted to do a film that has its own quality. In many ways our inspiration was our previous work. When talking we referred to Obsession (1998), or Anxiety (2001), or Virginity (1999). In that sense Reconstruction is a development of our own film-language. LC: How long did the shooting take? MAC: Six weeks of shooting and (very important) only eight hours a day, no more. Because of the union and the budget, it is very expensive to work longer… People need extra payment and that is why we only work eight hours a day. LC: What about those shorts? Were they shown by an institution? Is there in Denmark any place that shows films made by students or graduates? TGP: The shorts were exercises, and were only screened for a closed audience at the Film School, except for our graduation film Anxiety, which was partially financed by TV money and therefore shown on Danish TV. Anxiety has also travelled around the international short film festivals, Cannes in 2002 as well as Poitiers. LC: Was it difficult to produce the film? TGP: The difficult part was to get the budget… After graduation Christoffer was offered by producers at Nordisk Film Production to make a film under their newly launched low-budget concept “Director’s Cut”. Christoffer only wanted to do the film with his people, so he brought in the DOP, sound designer, editor and myself. One of the rules of Director’s Cut was that the budget shouldn’t exceed DKK 8,5 million (1.3 million US dollars). Christoffer’s script was wonderful and we went over and over the budget, and it just wasn’t possible to do the film for the 8,5 million. After long discussions with Nordisk Film’s producers they agreed to a budget of DKK 9,5 million, and from there on it was a fun ride. LC: How was the reception of Reconstruction in Denmark like? TGP: It was very well-received by the critics and the audience. It had almost 53,000 admissions, which is 20,000 more that estimated by the distributor. So they were very happy with the result. Of course 53,000 admissions is nothing compared to what the mainstream movies do at the box-office, but for Reconstruction it was very good indeed. LC: Could we say that in Denmark it’s very difficult to produce an art film, an independent one? I mean, are you overwhelmed by blockbuster movies? TGP: In Denmark we have a subsidy system that makes it possible for us to get films made. There are around five million Danes, and we are never going to make enough profit at the domestic box-office and at the video/DVD market to make a business out of it. Only a few films each year break into the international market. So we need the subsidies for the small art films as well as for the commercial ones. Between 20–25 films a year get subsidy money, so of course there’s a lot of projects that don’t make it, like everywhere else. But it is still not easy to finance the less commercial films in Denmark and for the most part we have to get finance from other countries like Norway, Sweden, Germany, the UK. LC: Do you agree with this system? TGP: We are privileged to have a government-funded subsidy system. There will always be things you feel could work in different ways, but yes, of course I agree with it. LC: You have mentioned Lars von Trier. Why did you emphasise last night the fact that Reconstruction is not a Dogma film? MAC: Dogma has been great for Danish films, it has positioned Denmark as a film country on the world map. Nowadays, I would say Dogma is becoming almost a bad word, it stands for shaking camera and very sad realistic stories… Maybe I just wanted to say that it was not a Dogma movie because many people expect Danish films to be Dogma. LC: Would you say that there is a film industry in Denmark? MAC: There is, but Denmark is such a small country that it is impossible to make a business around it. It has to be state-financed. TGP: I think that Danish films are taking around 20–23 percent share of the market in Denmark, which I’ve heard is the highest in Europe. The Danes are a loyal audience and they take an interest in their own culture and they go see the Danish films. We have two film festivals in Copenhagen. We don’t have any serious magazines that take film and film criticism seriously. MAC: 23 percent of the ticketing comes from Danish audience who see Danish films. That is a new phenomenon that has been growing within the last years. Before, I think, only 10 per cent were Danish movies. TGP: American films are of course very strong in the marketplace. LC: Do you think that Lars von Trier’s films and personality have any relation to that growth? MAC: No doubt! Lars von Trier has been a crucial person in creating a film culture in Denmark. His films have inspired and helped to raise the quality of Danish films to an international level. LC: What happened before and after Cannes? TGP: Before Cannes we were very busy getting the film completed. We had to cut two months out of the post-production schedule in order to make Cannes, so we had a completely crazy schedule with sound, colorgrading, lab work etc. After Cannes Christoffer of course got a lot of attention because Reconstruction won the Camera d’Or. Also the sales company got a lot of attention and they’ve sold the film to most of the world. Nordisk Film got their investment back which they never believed they would on such a small artsy film. All their numbers were red when they green-lighted the film, so I assume they are pretty happy with their investment now. For Christoffer and his next projects it has made it a little easier to get to the financiers but they of course still have to like the projects in order to get involved. LC: How much impact do you think that award will have on your future career? MAC: There is no doubt that it is very good for me. I have been contacted by several foreign directors asking me if I want to do the cinematography for their films. Up till now I haven’t done any jobs directly because of Reconstruction, but I have been asked by several people. I became known in Danish film. LC: To conclude: Would you say that Reconstruction is a kind of synthesis of your previous work? MAC: In many ways. But I think that our coming project that we are working on is a further development: Reconstruction hasn’t closed a circle.